got bored at home and did these..
yup. im THAT bored. anyone needs one? friends wanna link me? go to my links. which is the D block. yawnz. cant wait for charlie and the chocolate factory. union square on friday. salsa peeps see you there. i desperately need to practice my spins. anyone for country pot pie at coffee club? Posted in Yours truly... on July 31, 2005 by nadnut. perhaps it aint such a good idea to go out till the wee hours two days in a row. went clubbing wiv kenny on friday, came home, crawled into bed. overslept next day. yesterday was rather a sinful day. walked along esplanade park yesterday. memories... anyway, the fireworks were great yesterday! sinful i tell you. sinful for my tummy, my body and my wallet. anyway, being out with 2 lame guys is a huge mistake. putting them together = jokes, puns and the lamest humour. and billygoat: looking at me & my fringe is not equivalent to she bangs. -_-"
hahaa. i was technorati-ing and i found someone who linked me as: nads and her nuts. lol. i dun have any nuts by the way. lol. wahhahahaa. now leave me alone while me and my tummy recuperate. yes. i mean it. don't tempt me with good food. Posted in Friends on July 31, 2005 by nadnut. anyway, i managed to eat my crayfish and tenderloin pasta and had yummy icecream! yum. 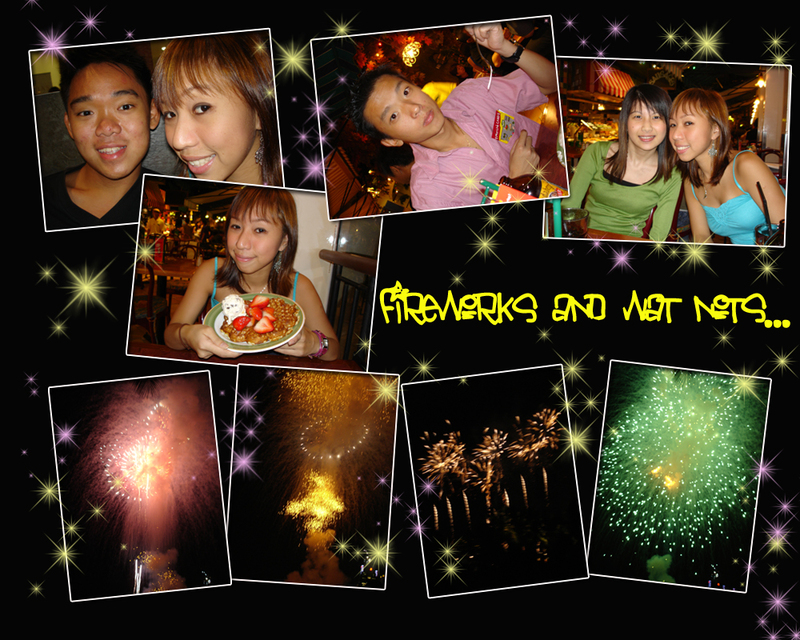 went to watch fireworks with mr kenny chan, colin and chong ah! eat. fireworks. eat. dessert. kenny's place for comedies. anyway a sidenote: went out with one of my salsamates for 'lunch' today. a nice lil 19 year old boy. makes me feel like a sugarmummy when i'm out with him. i paid by card and we went to eat at spaggedies. i dunno. just makes me feel like a sugarmummy. perhaps the fact that he was asking about cards and that i'm finally a working adult. and that he's going back to school soon. or perhaps the age gap? suddenly, i feel old. all these young kids make me feel old. i must be getting old. just came back from o bar with billy goat. this is the second time that i have went clubbing and only drank and am too tired to even dance. i just sat at the bar and drank. and drank. and in the end, i didnt get to eat my icecream!!!!! oh well. there is always tomorrow... did i mention that i went for a cut and colour recently this week? and i have the stupidest bangs now? yesh. toot toot old me. yawnz. i must be getting old. time to sleep... and to stoned.nerd, enjoy your trip!!! anyone for heavenly country pot pie from coffee bean, icecream from swensens and delish cheese crayfish and steak pasta from spaggedies? i'm craving for goooood food. yum. Posted in Friends on July 30, 2005 by nadnut.